The first named storm of the season is due to lash parts of the country with powerful winds and heavy rain. As quickly as Monday’s windstorm exited, another one arrived across the United Kingdom on Tuesday night and blew into Germany on Wednesday, threatening more wind and rain. In the United Kingdom, this storm has taken on the name Aileen. It is the first named wind storm of the 2017-2018 U.K. storm season. In Germany, the storm has been tagged with the name Sebastian. 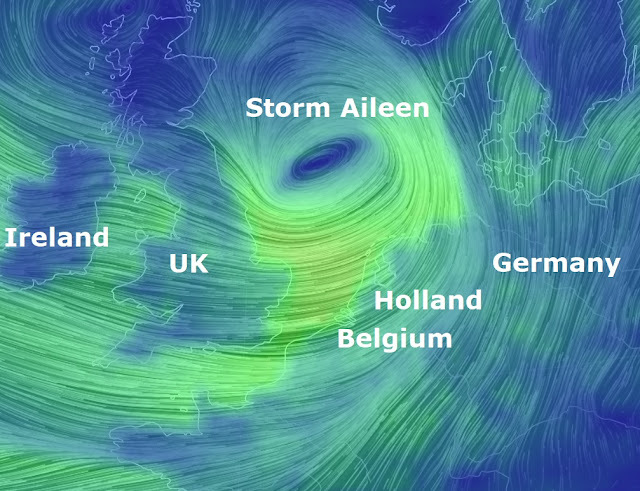 Drivers are being warned to avoid 53 exposed sections of road when Storm Aileen hits the UK and northern Europe with 75mph winds and heavy rain. The Met Office has issued an amber weather warning and is predicting severe gales in central parts of the UK. Strong winds of 55-65mph are expected across parts of Cheshire, Lancashire, Derbyshire, Yorkshire, Nottinghamshire and Lincolnshire. Gusts up to 75mph could wreak havoc in exposed locations such as the coast and hills in these areas. A yellow weather warning for rain is also in place for parts of Northern Ireland, northern England and southern Scotland, which could see 30 to 40mm of rain falling within six and nine hours. Highways England issued an amber "be aware" alert ahead of the storm, advising drivers to take extra care on motorways and major A roads. Motorists should check the latest road and weather conditions before getting behind the wheel. Met Office chief forecaster Frank Saunders said: "Storm Aileen is expected to bring strong winds of up to 75mph to a central segment of the UK and an amber weather warning has been issued. "As well as the strong winds, there will be some heavy rain pushing eastwards overnight which could see accumulations of 30 to 40mm. "The low-pressure system that is bringing these strong winds will move fairly swiftly from west to east over the UK and although there will still be heavy disruption through Wednesday morning, the winds will ease by the afternoon leaving a day of blustery showers." Richard Leonard, road safety spokesman at Highways England, said: "We're encouraging drivers to check the latest weather and travel conditions before setting off on journeys, with strong winds expected from Tuesday evening until Wednesday morning. There has been some speculation that this weather is being driven by the hurricanes tearing through the Caribbean and US, but there is no such connection.